The document transcribed and translated below has been provided to The Holocaust History Project by Dr. Bernhard Post of the Thüringisches Hauptstaatsarchiv in Germany. It has only recently become available. It is an internal memo by Kurt Prüfer, an employee of Topf and Sons, a company that built cremation furnaces. Prüfer was the builder of the Auschwitz cremation furnaces. 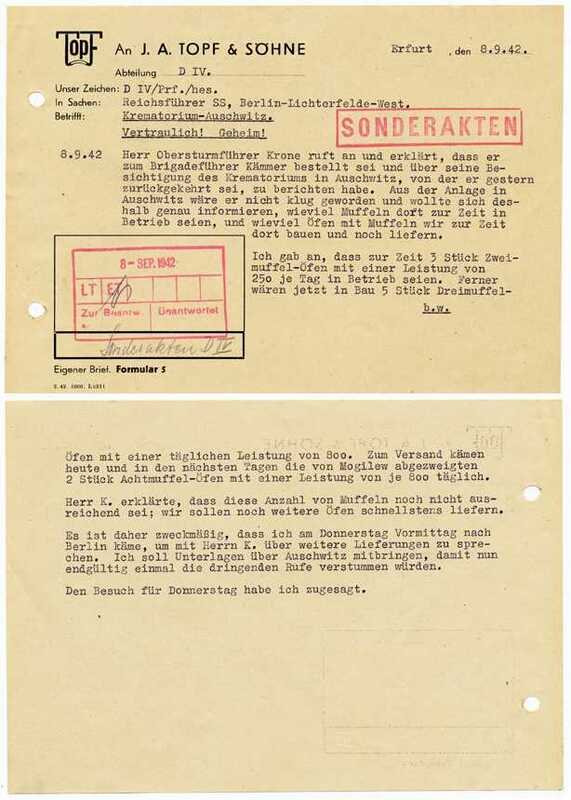 In this memo, which is labeled "secret" and "confidential", Prüfer recounts a conversation he just had with First Lieutenant Krone of the Works and Buildings Section of the Economics and Administration Department (Wirtschafts- und Verwaltungshauptamt, commonly referred to as WVHA) about Auschwitz's cremation needs. Krone has informed Prüfer that he has met with Brigadier General Kammler (misspelled in the memo as Kämmer), who headed the Works and Buildings Section of WVHA. Kammler is well known in Holocaust historiography as the recipient of a letter dated January 29, 1943 from the head of the Auschwitz Central Construction Agency stating that there was a "gassing cellar" in a building known as "Crematoria II" in Auschwitz. Prüfer relates that he has told Krone, who has just returned from Auschwitz, that the camp can be provided with enough cremation muffles to bring the cremation capacity up to 2650 per day, or 80,000 per month. However, Prüfer notes: "Mr. K said that this number of muffles is not yet sufficient; we should deliver more ovens as quickly as possible." Thus, Prüfer has been informed by the Third Reich's Buildings' section that a cremation capacity of slightly less than 1 million per year is not enough for Auschwitz's needs! This is the first document which has emerged before the building of 46 ovens in four crematoria in the Birkenau section of the camp (there were already six ovens in the Auschwitz main camp) which gives a true picture of the homicidal nature of Auschwitz from the perspective of how the SS in Berlin viewed the camp's real cremation needs. The memo categorically refutes Holocaust deniers who claim that the Auschwitz crematoria were merely used for normal sanitary purposes. No denier has ever claimed that normal sanitation would require such an extraordinary cremation capacity. At the time the memo was written, gassing victims were burned in outdoor areas near two provisional gas chambers. This memo is dated September 8, 1942 and should be read in accordance with two other contemporaneous documents relating to Auschwitz from the same period. The first is dated August 21, 1942 where Prüfer is mentioned in relation to ovens needed because of "bathing installations for special actions". The bathing installations were homicidal gas chambers disguised as showers. At the time, two buildings that lay outside of the camp had been converted into gas chambers. Some months later the phony showers were moved into the crematoria after those buildings were completed. The second key document dealing with the "special actions" is a diary kept by Auschwitz camp physician Dr. Johann Paul Kremer. On September 2, 1942 he wrote: "For the first time, at 3:00 A.M. outside, attended a special action. Dante's Inferno seems to me almost a comedy compared to this. They don't call Auschwitz the camp of annihilation for nothing!" Kremer recorded 12 additional special actions at which he was present before leaving Auschwitz on November 18, 1942. (Relevant entries are in KL Auschwitz Seen by the SS , published by the Auschwitz State Museum) During this period, there were many other "special actions" at which he was not present. The original of the document is available for viewing. In Sachen:      Reichsführer SS, Berlin-Lichterfelde-West. dort bauen und noch liefern. 2 Stück Achtmuffel-Öfen mit einer Leistung von je 800 täglich. reichend sei; wir sollen noch weitere Öfen schnellstens liefern. endgültig einmal die dringenden Rufe verstummen würden. Den Besuch f�r Donnerstag habe ich zugesagt. In Matters of:  Reichsführer SS, Berlin-Lichterfelde-West. and are still to be delivered. of 800, will come on consignment, redirected from Mogilew. we should deliver more ovens as quickly as possible. morning in order to discuss further deliveries with Mr K.
the urgent calls can be finally silenced once and for all. I have agreed to the visit for Thursday.